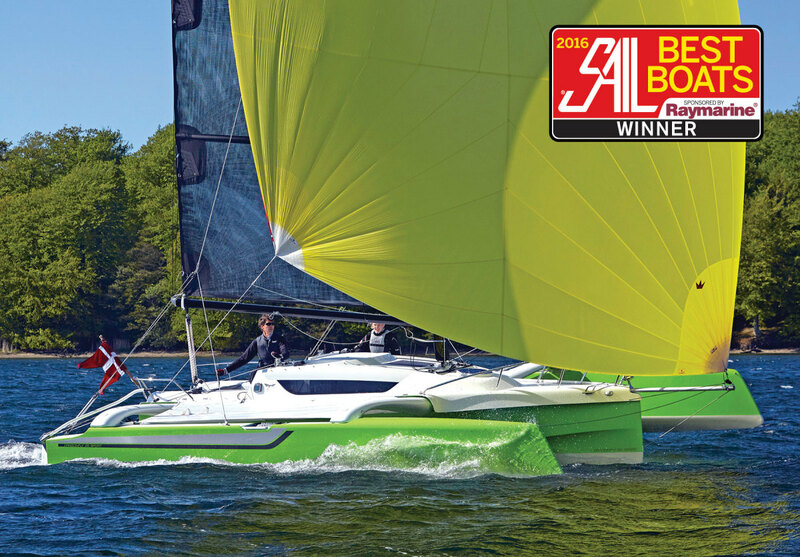 This latest offering from Denmark’s Quorning Boats, which won a nod from SAIL’s 2016 Best Boats judges as their Best Small Cruiser, is the smallest boat in the builder’s current line of folding “Swing Wing” trimarans, which range all the way up to 40ft in length. Quorning, refreshingly, is something of a throwback as modern boatbuilders go. It is a small family-owned concern that’s been in business some 40 years now and is focused on quality. Much like Nautor’s Swan in its heyday, Quorning also tries to make everything that goes on its boats in house. As Jens Quorning, son of the founder, who now runs the company, put it to me, “We make everything except the cushions, engines and electronics.” Which admittedly is a bit of an exaggeration, but not too far off the mark. I sailed the “touring” version of the boat with Jens out of Annapolis after the show last fall, and he demonstrated how the folding amas work as we pulled off the dock. The amas, with reverse wave-piercing bows, are in fact longer than the main hull and are controlled with a pair of continuous lines in loops. You lead these to winches to cinch them tight and secure them with rope clutches—a very simple procedure. They pitch up as they extend outward, so that the boat’s buoyancy is centered in the main hull when sailing. They then cant back down again when retracted so that buoyancy is spread out to keep the boat stable when folded up. In its particulars the Dragonfly 25 is cleverly conceived. The centerboard is slightly offset to port, with its trunk buried under a settee to save accommodation space in the main hull’s interior. Furniture components are modular, so they can be removed for racing or a thorough cleaning. The auxiliary Tohatsu 6hp long-shaft outboard motor on the transom needs no telescoping bracket and somehow magically does not interfere with the transom-mounted rudder. To increase living space when not sailing, an easily erected tent turns the cockpit into a sheltered dining room, as the saloon table can be quickly replanted outside. Our test boat featured the standard aluminum rotating cruising mast (manufactured by Quorning), and we had no problem keeping the boat moving in the light conditions that confronted us. In 6 to 8 knots of true wind building to 10 knots we made 6 to 8 knots of boatspeed under a screecher on a close reach, and 8 to 9 knots under an A-sail at wider angles. Sailing closehauled with the jib unfurled we made 4 to 5 knots at an apparent wind angle of about 40 degrees, which I imagine could get even higher in good pressure. The helm was light and easy to manage, and with a tiller extension you can comfortably steer from the ama nets outboard of the main hull. 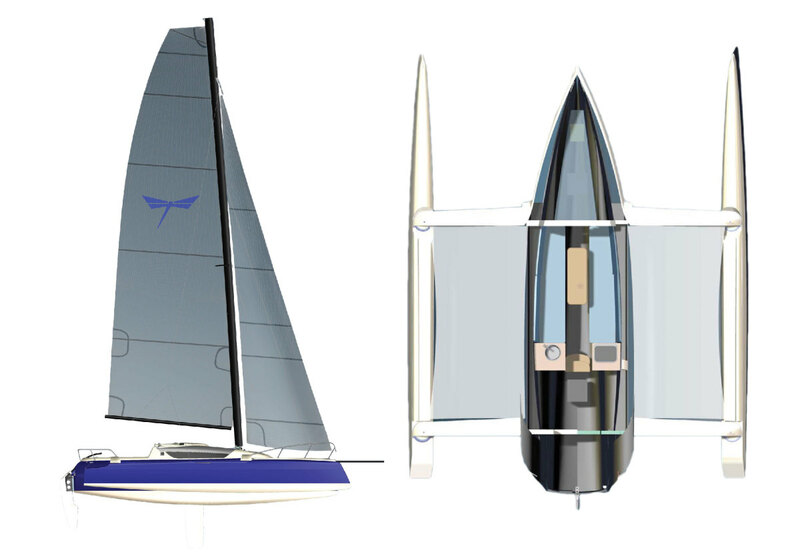 For those interested in maximizing performance, a sport version of the boat is available with a taller carbon-fiber rig from Denmark’s Vision Mast, Elvstrom EPEX laminate sails and twin rudders set outboard on the amas. According to Jens, the top speeds achieved have been in excess of 20 knots in very strong conditions, while 15 knots is common in a moderate-to-strong wind. The boat’s hulls are built of handlaid biaxial glass fabric set in polyester resin around a Divinycell closed-cell foam core. The ama wings and structural bulkheads are set in vinylester and heat-cured in an oven. The main hull has a pronounced hard chine with an overhanging hull-deck joint eyebrow above it: together these features should help knock down spray and keep the boat dry in more boisterous conditions. Trailering weight all up is only about 3,500lb, which means you should be able to haul your boat and kit to new cruising grounds (or race venues) with a good-sized car. The optional trailer is priced at about $3,900 and pivots so that you can launch and recover the boat without submerging the wheels. The boat can be rigged singlehanded, and with an experienced helper you can get launched and ready to sail in as little as 30 minutes.